We believe it's easier for everyone, if the forums evolves by itself. For this reason we would like to introduce you a proper tag system. 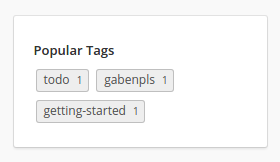 Those categories should define their own tags in their own native language! You can either add an existing tag, or create freely a new one if none of the existing tags fit. Each category is filled with a tag-cloud that shows the most used tags. To find a discussion of your interested click a tag and it will filter all discussions by that specific tag. We have learned that it it's hard to keep up with the community demands of forum sections. For this reason we make use of the tag system. With the growing off the community new categories needs to evolve, and some become redundant. Especially in foreign forums it's almost impossible to keep an overview. There are certain tags we determine useful, which you could use in the future (remember each language section should define tags in their native language). Tags should be short and easy to understand and it's usually always better to refer to existing tags! It is much more likely that you receive help if you use the existing help-needed, instead of creating a new unrelated tag for example. We hope this turns out useful and you guys can work with it.